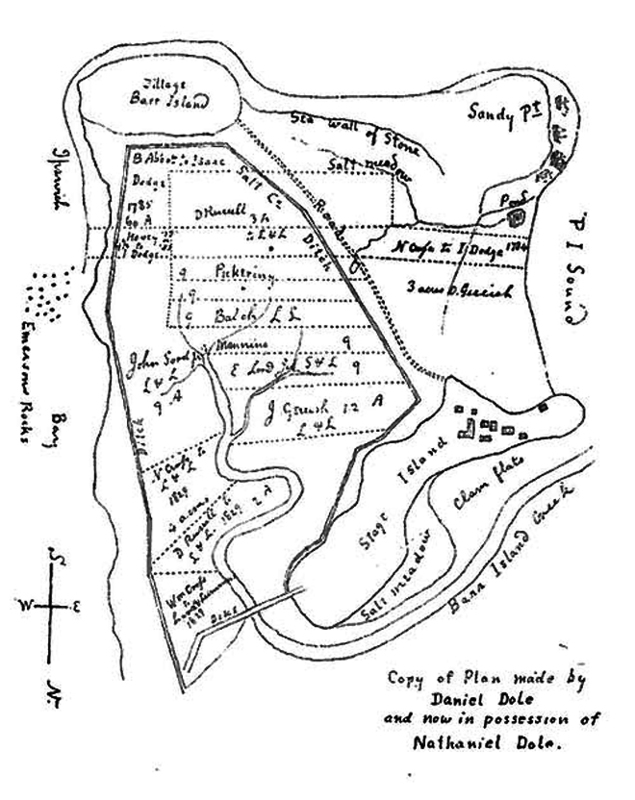 Plum Island Salt Company factory plan. Note that the map is oriented toward the south, with the Ipswich bar at the top. In the Publications of the Ipswich Historical Society I read the forgotten story of the Plum Island Salt Company. All traces of its existence have disappeared. Gilshenan succeeded in organizing a company with the backing of Francis J. Oliver and George W. Heard of Ipswich. The deeds were passed in April, 1829 and work was begun at once, giving employment to a considerable force of laborers. 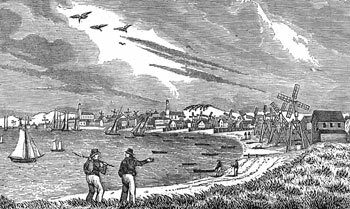 The Frenchman appointed Daniel Boynton as captain of the laboring squad and it fell to him to martial his little company in military fashion for the march to and from the Salt Works to the houses where they were quartered. Twenty eight vats were dug into the peaty sod adjoining a canal eight feet wide and ten feet deep. Sea water was pumped up by six old-fashioned windmills to a height of twenty or thirty feet and then was allowed to fall upon a heap of brush through which it trickled to the vats securing thus a large evaporating surface. Being exposed to the heat of the mid-summer sun, the water gradually dried away and crystals of salt appeared in the shallow vats. The windmills were supplemented by a great overshot wheel fifteen feet in diameter and six feet wide, suspended in an upright position from a heavy wooden frame. It was made to revolve in a very original way: A large bull was confined within the wheel like a hamster in his revolving cage and his walking turned the wheel. Shallow buckets on the outer rim lifted the water from the canal. (note: I was unable to find any illustration or other example of this bizarre contraption). Speedy misfortune overtook the ambitious venture. Heavy rains diluted the water in the open vats. Salt in paying quantities was not produced. In an 1830 article in the Newburyport Herald the correspondent wrote that a loss of thirty or forty thousand dollars had been involved, concluded his article with the remark, “The French gentleman with superintendence of the work is a very intelligent man and bears the misfortune with all that buoyancy of spirit so peculiar to his countrymen.” The whole property was advertised for sale in 1832 by George W. Heard including six windmills, a dam and assorted apparatus. No trace remains today. The next grand scheme was shipping sand for construction. 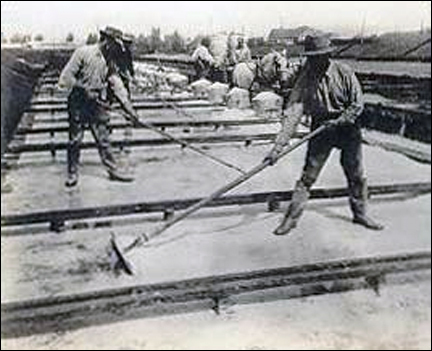 In the late 1800’s fifty tons of sand were being removed from the island each day and loaded in sand schooners. The Ada K. Damon, loaded with sand, famously wrecked on Crane Beach on its first delivery. Well into the 1900’s Plum Island served as a tourist destination with the Plum Island Hotel at the north end and the Ipswich Bluffs Hotel at the southern end. Hunters flocked to the island, annually killing thousands of migrating waterfowl, which in turn provoked a public campaign to protect the island and the birds. In 1942 most of Plum Island became part of the Parker River Wildlife Refuge, one of America’s first national seashores. The southern tip of Plum Island where the old Salt Factory and the Ipswich Bluffs Hotel once stood is now Sandy Point State Reservation. My understanding (no documented source, likely wrong:-) is the old salt vat holes became all flooded together (some creek?) and turned into the fresh water pool where hordes of birds nested and which attracted all the “market hunters” of a century ago. That area is now the Stage Island Pool, and is easy to miss even though it’s very close to the surrounding road, Sandy Point Reservation, and the beach. I heard that a few years ago it was so dry around here the amount of water in that pool fell so much it was no longer enough to dilute the effect of all the lead shot those market hunters had left on the bottom, and as a result many birds (some rather rare) died of lead poisoning over a period of a few weeks.